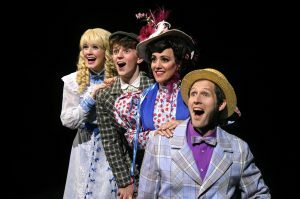 Spokane Civic Theatre’s production of “Hello, Dolly!” owes a lot to an area fabric store. It was there that they found star Robbi Starnegg; it was also there that costume designer Jan Wanless found the material for her beautiful costumes. Starnegg plays Dolly Gallagher Levi, a sought-after matchmaker tasked with finding a wife for “half-a-millionaire” widower Horace Vandergelder (Thomas Heppler), whom Levi herself is pining for. At the same time, Levi negotiates the matchmaking of Ambrose Kemper, played by Preston Loomer, who has his sights set on Vandergelder’s niece Ermengarde (Marlee Andrews). 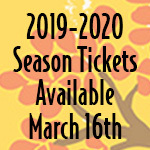 The musical is directed by Troy Nickerson and features lyrics and music by Jerry Herman and a book by Michael Stewart. As Levi, Starnegg, in her first role at Civic, absolutely shines, completely embodying the strong-willed and quick-witted matchmaker. “Some people paint, some people sew,” she says early in the show. “I meddle.” Starnegg has a wonderful, full voice, and all the charm a character like Levi requires, and Heppler, as the rough-around-the-edges Vandergelder, is a fantastic contrast to Levi’s endless joy. Loomer was really fun as the anxious Kemper, and Andrews is hilarious as Ermengarde, throwing massive fits left and right. Lorelei Dimmel is charming as Minnie Fay, assistant to Irene Molloy, a milliner Levi is trying to set up with Vandergelder, and Heidi Santiago really expressed Molloy’s yearning for romance and something more than hats. Calen Martin, as Cornelius Hackl, and Nicholas Griep, as Barnaby Tucker, Vandergelder’s chief clerk and assistant, make a great pair, playing the sweet, small-town guys longing for adventure in the big city, including everything from eating a good meal to getting arrested or kissing a girl. Both also had great chemistry with Dimmel and Santiago. The ensemble (Alex Barclay, Teo Damitio, Olivia Davies, Jenner Davis, Jerrod Galles, Cesar Galvan, Leah Hansen, Alyssa Hersey, Robin Hill, Tre’ Keough, Elizabeth Martin, Jessica Martin, Leilani Santiago, Amber Sety, Logan West, Eric Wilson and Mickey Zhang) brings a wonderful energy to the show and handled Jillian Kehne’s choreography well. Kehne deserves a special nod for her work on the show, making moments both big (group numbers) and small (moving a bottle of wine from one side of the stage to the other via members of the ensemble) fun to watch. Nickerson’s choice to make the sets more simplistic was a smart one, as it put the focus entirely on the cast. Though, as usual, David Baker’s sets were lovely to look at – especially the Harmonia Gardens Restaurant, with its grand staircase and lavish curtains.